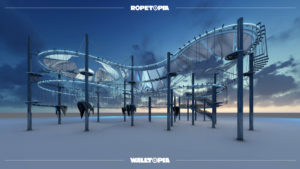 Walltopia announced a new product in the ropes course industry at IAAPA – Ropetopia Curves. 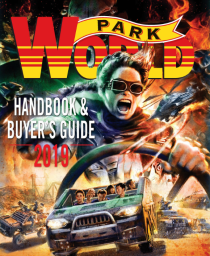 It’s a next generation ropes course with an entirely new belay line that unlocks limitless design possibilities and gives an alternative solution to some of the issues that ropes courses usually encounter. This new approach towards building ropes courses is said to solve problems like traffic on platforms where visitors wonder which route to take or come back the same way and repeat obstacles or just try to remember if they already went through that obstacle or not. Businesswise, this type of belay line brings higher throughput due to its single direction progression which leads to less waiting time on the front and more tickets sold. A second belay channel for operators is in place if assistance is needed. Furthermore, Ropetopia Curves is also said to be the first ropes course that offers completely free approach towards design. It can take any form, any curve, any shape. Every project is unique and custom fit to the available space. Complex footprint with very limited space is no longer an issue. The flexibility of Ropetopia Curves allows implementation towards existing attractions and placing it on places never possible before. “We are extremely excited to come up with this entirely new approach towards building ropes courses. This new curved belay line allows unparallel designs and gives visitors less time making choices and more time owning them. 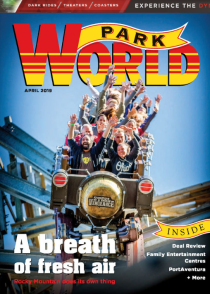 With this extreme flexibility, we are now free to do ropes courses however our imagination desires.” Shared Ivaylo Sotirov, CEO Walltopia Active Entertainment USA.